In what ways did various leading figures of the Renaissance impact modern society? The period in Europe known as the Renaissance began in Italy around 1300. In this chapter you will learn how Renaissance ideas spread from Italy across Europe. You will study the lives and work of ten leading figures of this rich cultural period. From the 14th through the 16th centuries, Europe crackled with energy. Trade and commerce boomed. Cities grew. Artists and writers experimented with their crafts and created wonderful works of art and literature. New ways of thinking led to inventions and scientific discoveries. Rulers and wealthy patrons supported the work of artists, scientists, and explorers. Why was there so much creative energy during the Renaissance? One reason was the Renaissance idea that people should be educated in many areas. People who studied art or music, for example, were also interested in science. To this day we still use the term “Renaissance person” to describe someone who is skilled and knowledgeable in many fields. 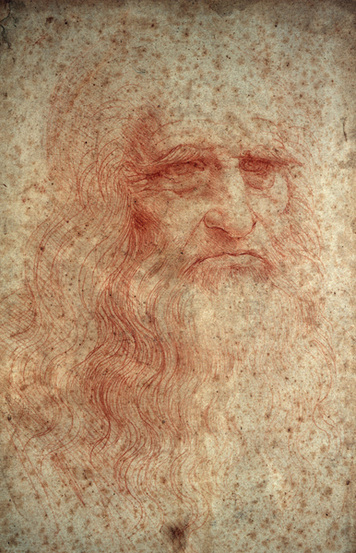 Leonardo da Vinci is often considered to be the ideal Renaissance person. Leonardo trained mainly as a painter, but he was also a scientist, engineer, musician, and architect. He designed fortifications, waterways, and machines. He studied and drew plants, animals, and people. In his notebooks, he sketched ideas for inventions that were far ahead of his time. Leonardo is one of the ten Renaissance people you will study in this chapter. You will learn how contributions made by these leading figures affect society today. You will also learn how the Renaissance spread from its birthplace in Italy throughout Europe. As you have read, the Renaissance began in Italy. From there it spread to France, Germany, Flanders (modern-day Belgium), Holland, England, and Spain. The diffusion of Renaissance ideas occurred through trade, travel, and education. Italy was the gateway to Europe for much of the trade from Asia, Africa, and the Greek-speaking cities of the east. Traders moved through Italy to the rest of Europe, bringing a rich flow of new ideas along with their goods. Visitors to Italy also helped spread Renaissance ideas. People from all over Europe traveled to Italy to learn, as well as to trade. Scholars went to study humanism and medicine. Artists studied Italian painting and sculpture to learn new styles and techniques. When these travelers returned home, many of them founded art schools and universities. Artists taught others what they had learned in Italy. Scholars began to teach the new ideas of experimentation, observation, and logic. The spread of ideas was made even easier by the invention of the printing press. This machine pressed inked type or plates onto paper to create many copies of a work. You may recall that the Chinese had learned to make paper and to print using wooden blocks. The Koreans had invented a kind of movable type. Gradually, knowledge of paper making and examples of Asian printing reached Europe. In about 1450, a German named Johannes Gutenberg dramatically improved on existing printing methods. He invented a printing press that used movable type—characters that could be rearranged and used over again. Unlike the Chinese, who used wooden blocks, Gutenberg cast his type in metal, which was much more durable. Before Gutenberg’s invention, most books were written and copied by hand. 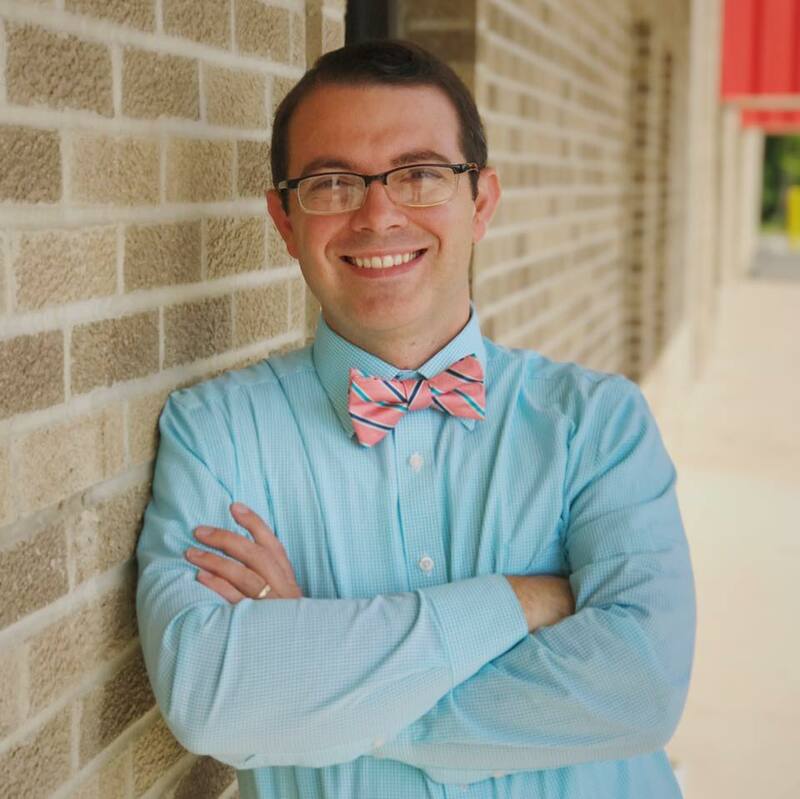 It could take four or five months to copy a 200-page book. The new press could produce 300 pages in a single day. As a result, books and short works, called pamphlets, could be made much more quickly and cheaply. The number of printers in Europe increased rapidly. People used printed matter to communicate new ideas, discoveries, and inventions. And, since printed material was more widely available, more people learned to read. Michelangelo (1475–1564) was one of the leading artists of the Renaissance. He was born in a small village near Florence and grew up to be one of the greatest painters and sculptors in history. Personality and Training Historians say that Michelangelo had a difficult childhood. His mother died when he was six years old. His father was stern and demanding. Perhaps this troubled early life contributed to Michelangelo’s famously bad temper. Although he was very religious, he was known to use fierce words when he was angry. He was also intensely ambitious. When Michelangelo was 13, he became an apprentice to a painter in Florence. At 15, he began studying with a sculptor who worked for the powerful Medici family. Michelangelo lived for a time in the Medici household. There he met many leading thinkers, artists, and writers. Talents and Achievements Michelangelo was gifted in both sculpture and painting. His art combines Renaissance ideals of beauty with emotional expressiveness. Michelangelo’s sculptures show his amazing talent for carving lifelike figures from blocks of marble. When he was just 24, he carved his famous La Pietà. A pietà is a depiction of Mary, the mother of Jesus, mourning over her dead son. Michelangelo’s Pietà shows Mary tenderly holding the body of Jesus across her lap. Two other magnificent sculptures by Michelangelo are his David and Moses. Michelangelo’s David is 17 feet tall. The statue combines great beauty with the intense look of a youth who is about to go into battle. Michelangelo’s Moses is a strong, powerful figure. The statue shows Moses holding the Ten Commandments, which the Bible tells he received from God. Michelangelo is perhaps best known for painting the ceiling of the Sistine Chapel, the pope’s chapel in Rome. Michelangelo labored for almost four years on a high platform to complete this work. He covered the curved ceiling with brilliantly colored scenes from the Bible. The scenes contain over three hundred figures and continue to awe visitors to Rome today. 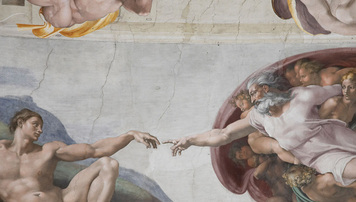 How did Michelangelo impact modern society? How are you going to represent Michelangelo in your project? Come to class with a design of what you would like to do to represent Michelangelo in your project. You will share this with your peers at the project collaboration station.